Delight as the popular ASOS team visit Bioglitter HQ! Every day is a busy day at Bioglitter HQ. Our team are constantly working hard behind the scenes to help take our eco-friendly glitter to the next level. Of course, we have an excellent story to tell and that’s why we do like to have a guest or two every so often to show people exactly what we do! Well, recently, we welcomed fashion giants ASOS to our HQ to show them where all the magic happens. ASOS have recently launched their first ever YouTube series and the first episode covered Bioglitter and body confidence. The episode covered a wide range of topics, none more so than the issue of plastic glitter at festivals. 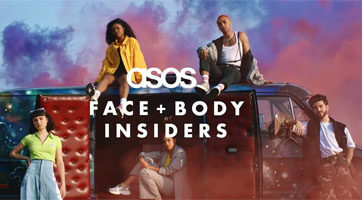 We were only too happy to answer the request of ASOS and tell their viewers about who we are and what our journey is all about. Our very own Stephen Cotton was the star of the show and he spoke about what Bioglitter is and the real issues of plastic glitter. He certainly did Bioglitter proud with Team ASOS being extremely impressed along with prominent bloggers that featured in the video as well. We’re hoping this is just the start of a huge journey for us, where people want to know more and ultimately use Bioglitter.